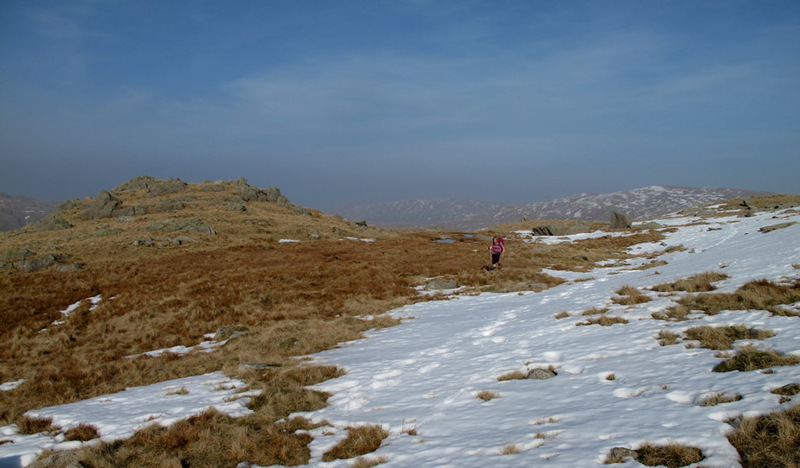 " Rossett Pike in Winter sunshine "
Date & start time: Tuesday 5th March 2013, am start. 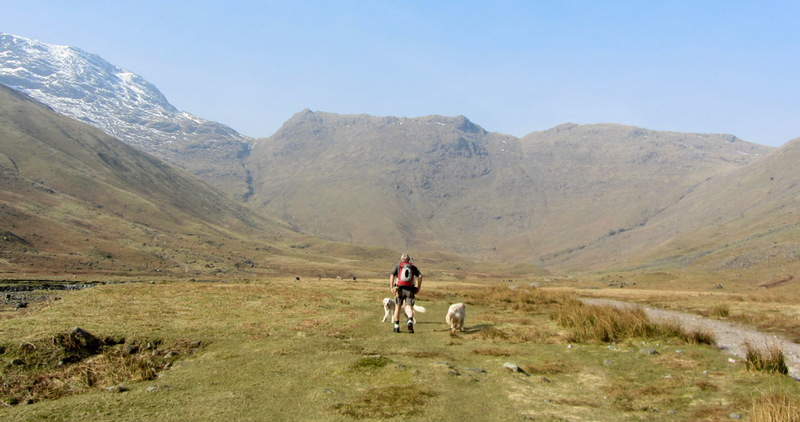 Places visited : Mickleden, Stake Pass, Rossett Pike, Rossett Gill, Mickleden and back. 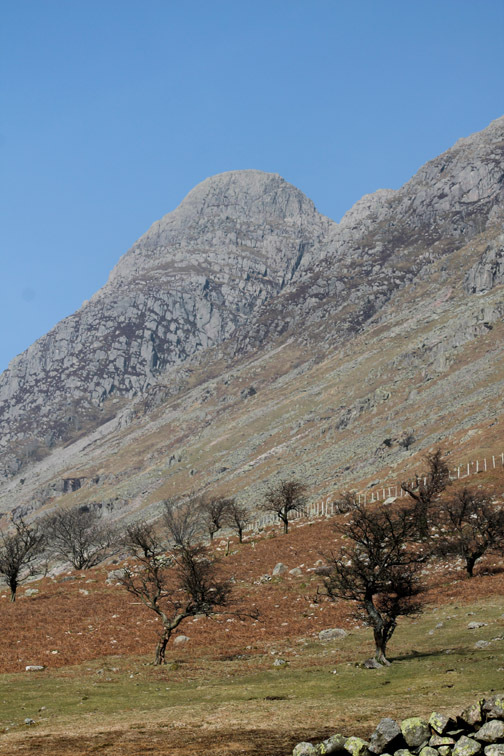 Walk details : 7.9 mls, 1950 ft of ascent, 5 hours 50 mins. 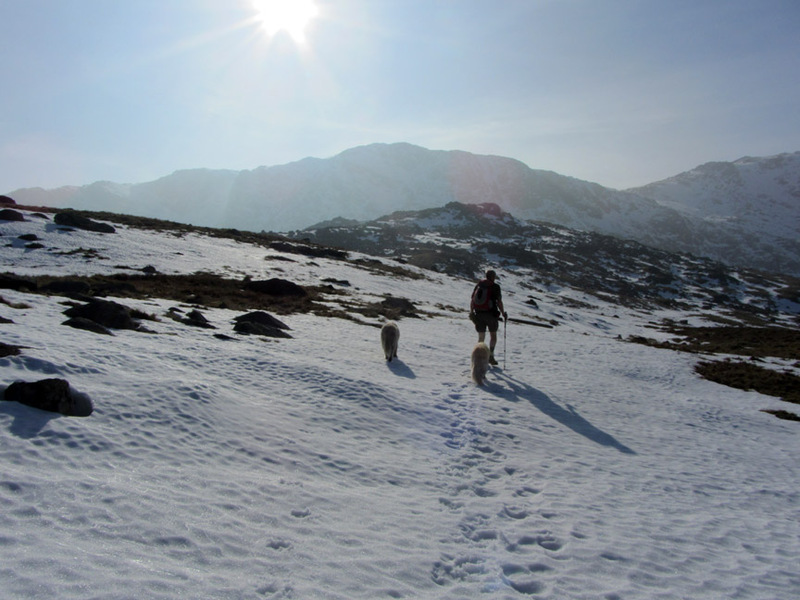 Walked with : Ann and the dogs, Harry and Bethan. Weather : Sunshine and blue skies, a cool breeze on top and cooler in the shade (naturally). 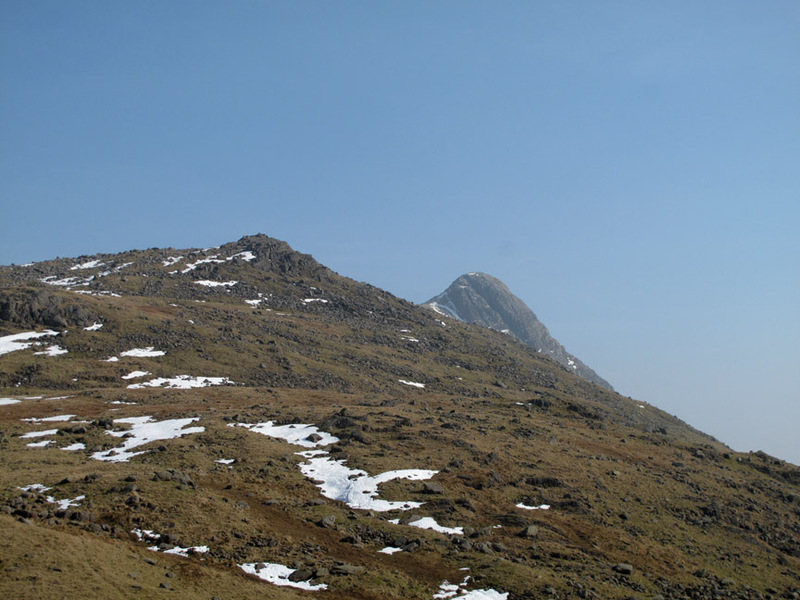 we make a determined effort to visit another of our missing third round peaks. 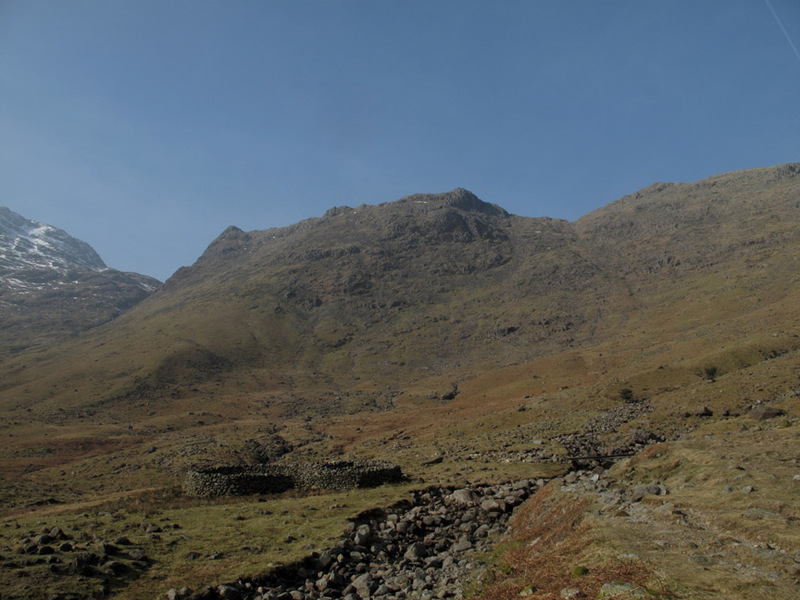 We have to travel an hour down to the Langdales and walk an hour up Mickleden Valley before we even start our climb. Start out as you mean to continue . . . and as you mean to end ! What a delightful prospect as we see the snow covered peaks through the bare winter branches. 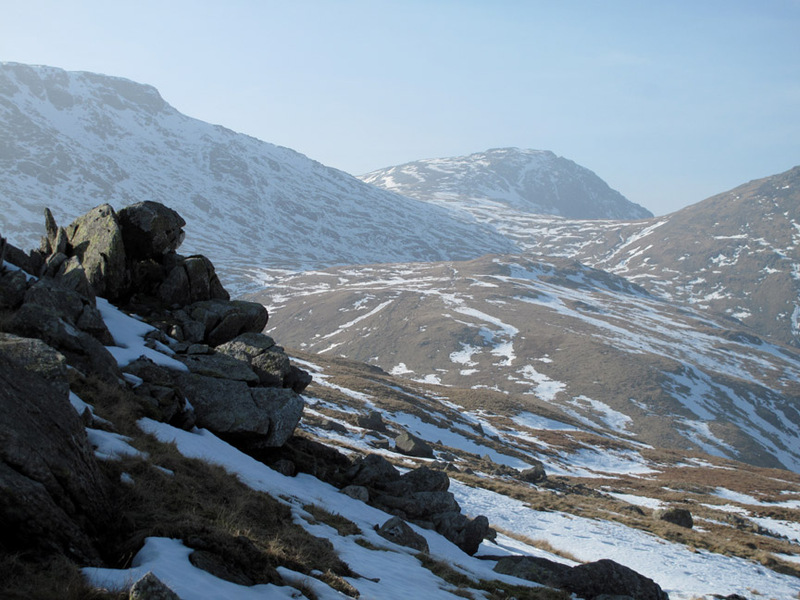 The sun is bright but the temperatures still low and the snow is still present on the high fells. 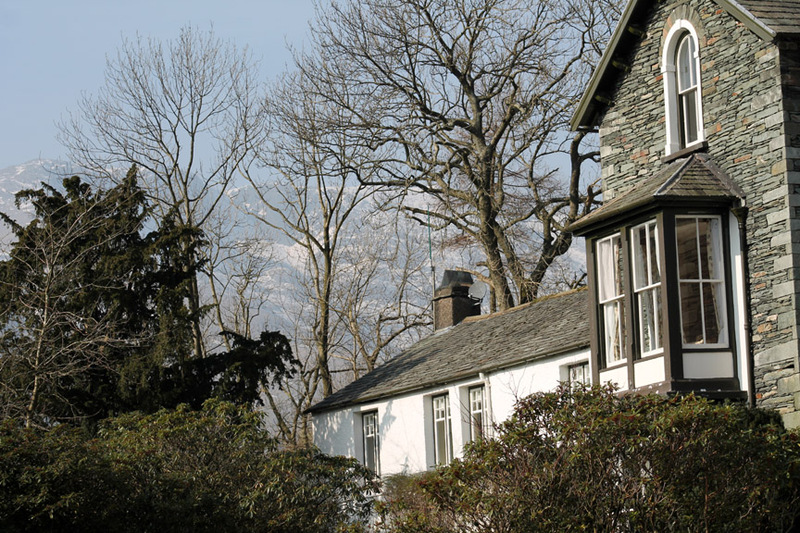 It was almost Swiss in style as we look up at the high fells. Our path takes us behind the hotel and out into the valley . . .
. . . where we get our first view of the mighty Pike O'Stickle. 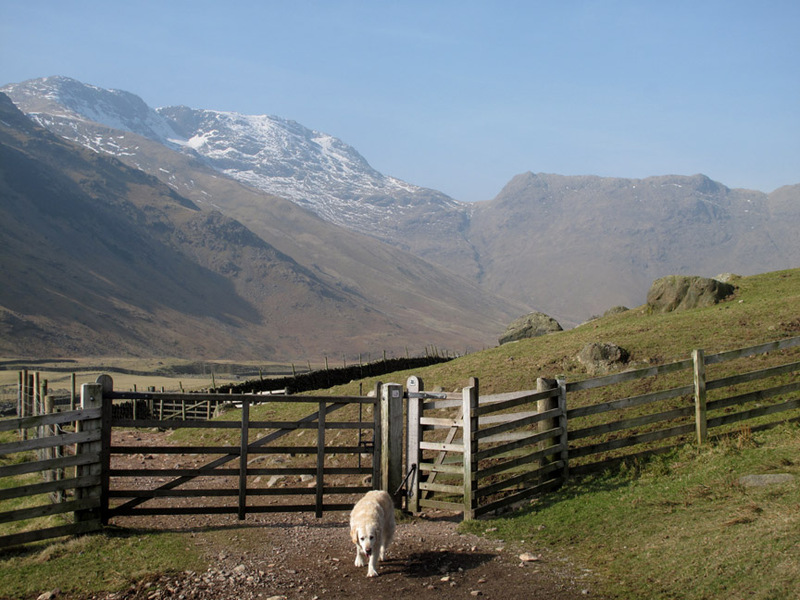 The last gates to the open fell . . . or here the open valley. 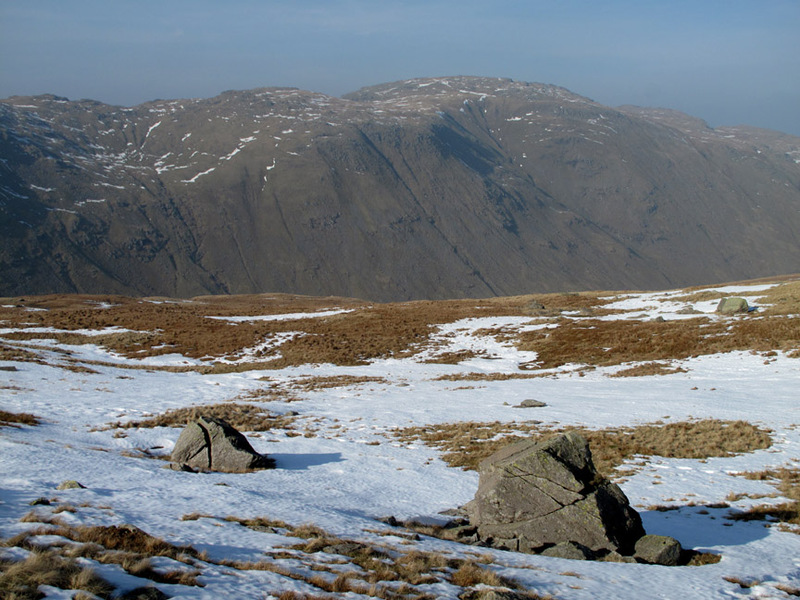 Our objective today is Rossett Pike, the green fell on the right rather than snowy Bowfell on the left. Summer walking trousers were unzipped to make shorts . . . which gives you an idea of the temperature in the sunshine today. Wide angle view here as any closer would reveal too much leg ! 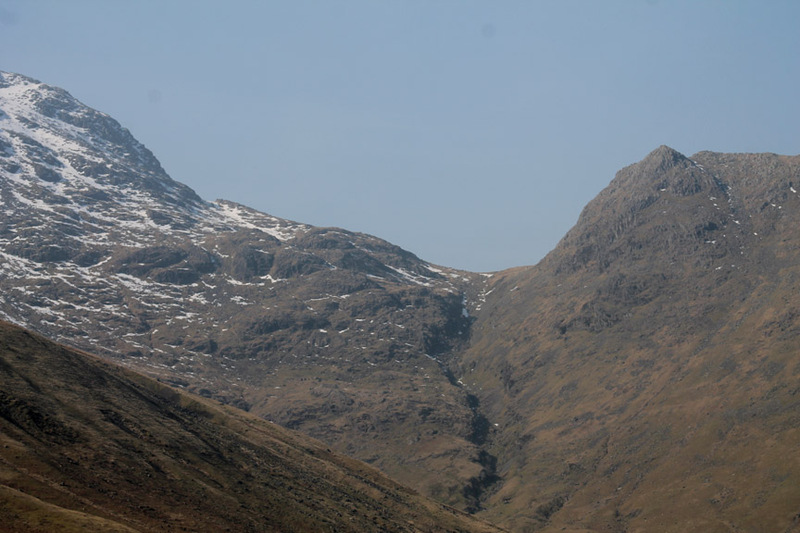 Pike O'Stickle with Loft Crag to the right. A large winter landslip has brought down a large mass of turf and soil. Each one of those lumps of grass was about six foot wide and a foot thick . . . quite some power involved no doubt. Looking ahead as we approach the moraine towards the top of the valley. 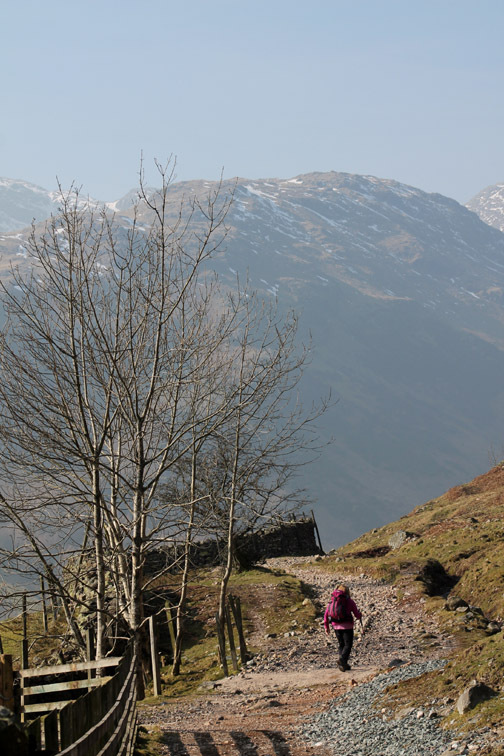 The walk in is about a mile and a half, most of it is a flat but stoney track. 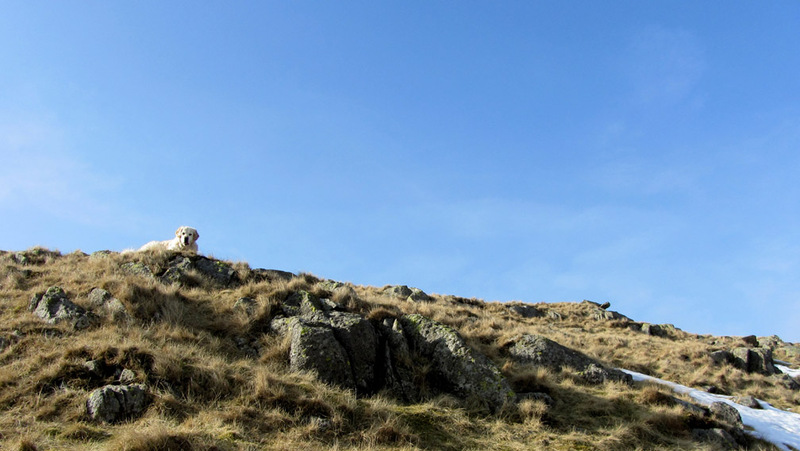 involving a high level ridge walk of the Pike itself. 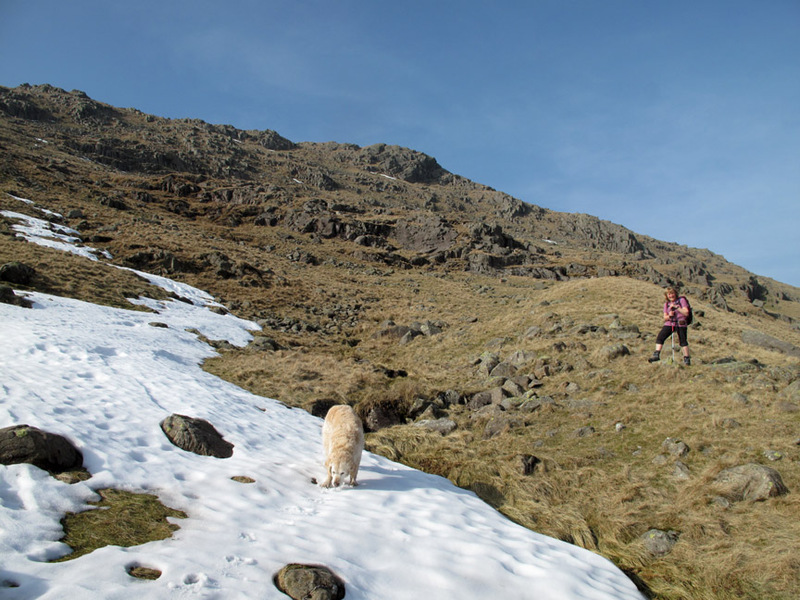 We'll leave the Rossett path, seen faintly with a slight infill of snow, for our descent. It starts at the coll and traverses down to the left. Looking back as we near the moraine. 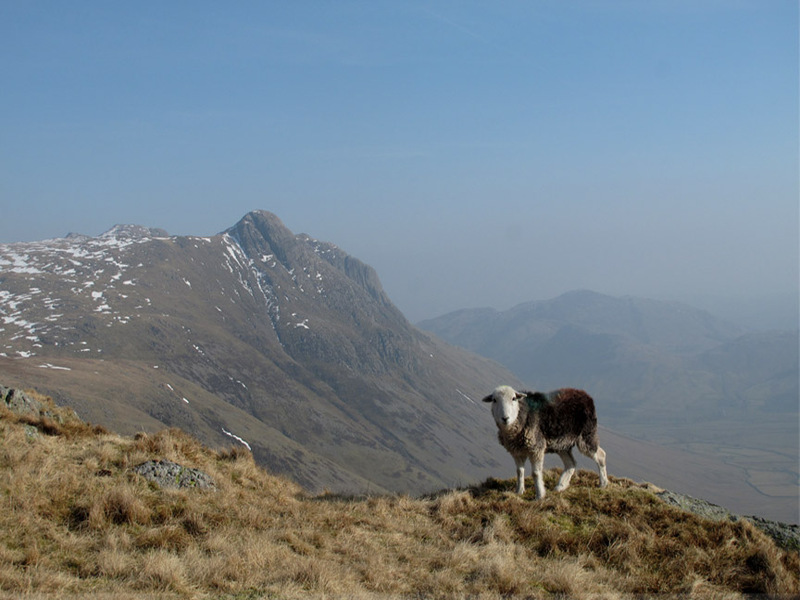 Lingmoor, Side Pike, the ridge to Pike O'Blisco and the Band are all in view. 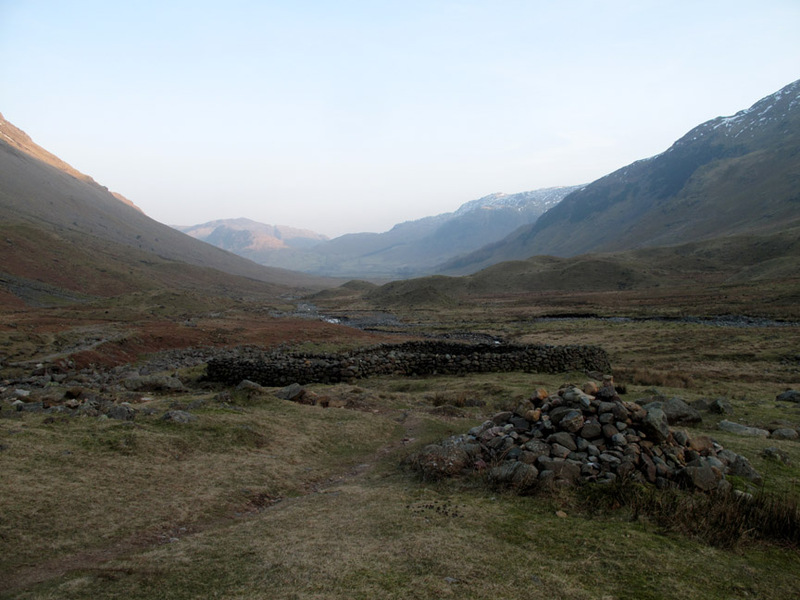 The sheepfold at the head of the valley is still in good condition. It marks the change in the walk . . . as from here the only way is up. Across the simple Stakes Gill bridge . . .
. . . and turn right to start our ascent. Taking in the view it is called . 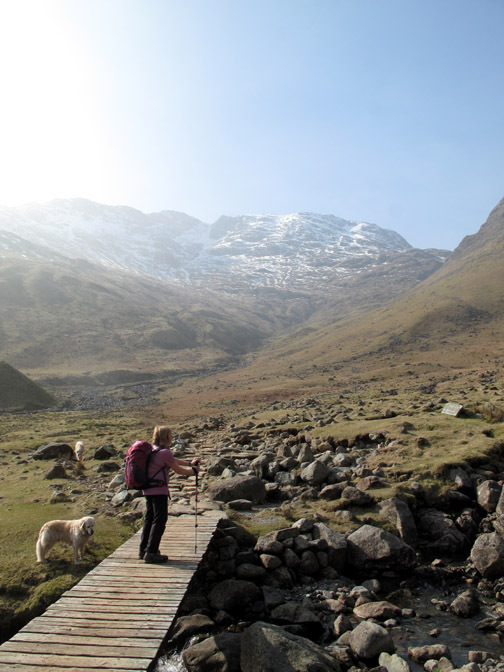 . . we look back, an hour into the walk, and we've hardly started any climbing at all. Well on the way up now as we look down at the zig-zags. 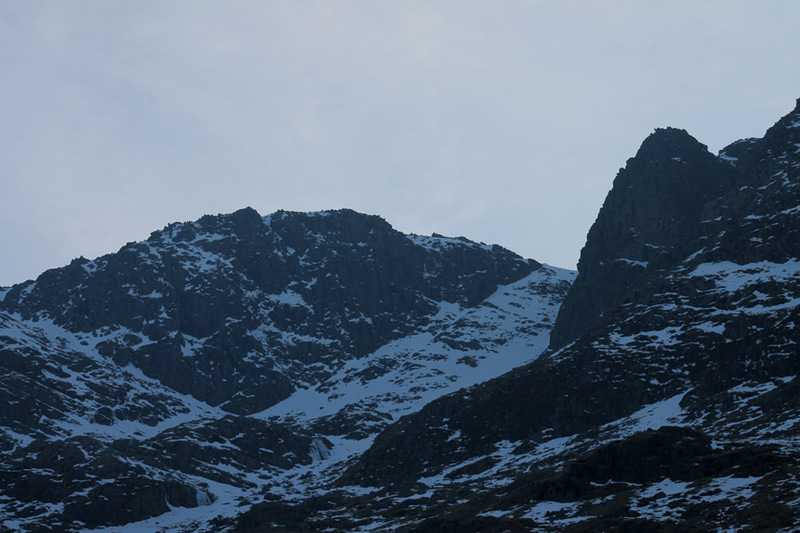 Pike O'Stickle is as dramatic as ever. 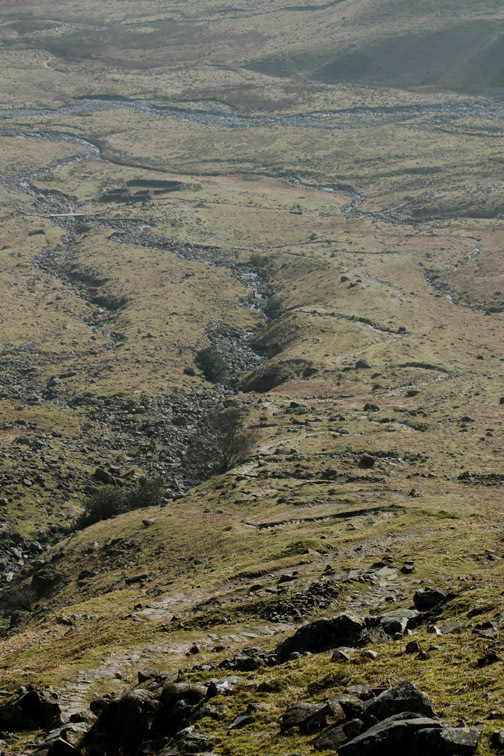 The photo shows about the first half of the climb from the sheepfold below. 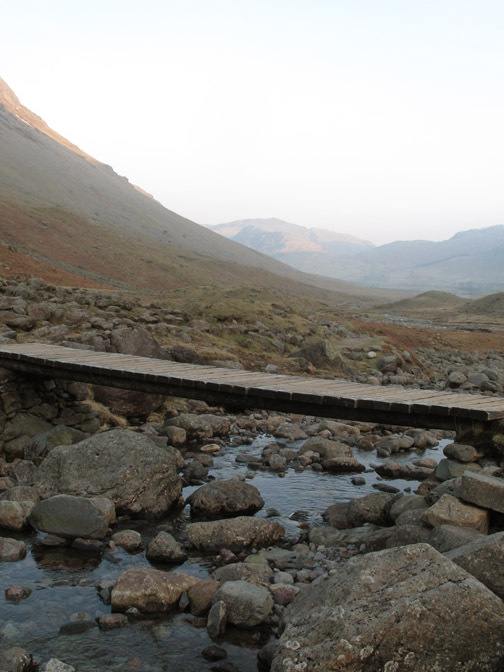 It's a good path and straight forward walking as this is a significant path for many, crossing the high ground between Langdale and Borrowdale. 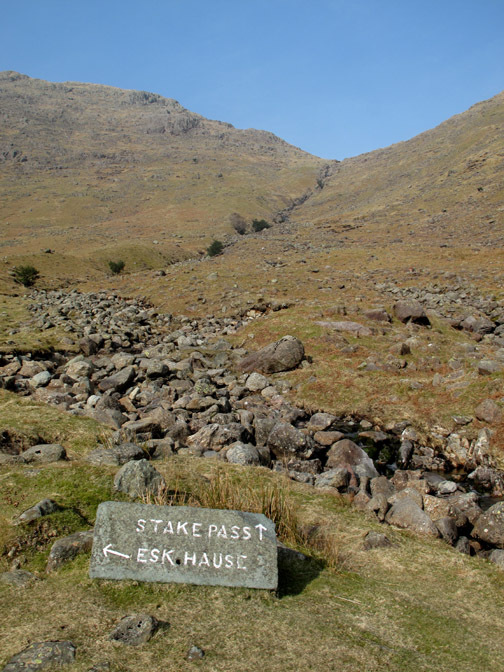 We leave the main path as it crosses Stakes Gill. 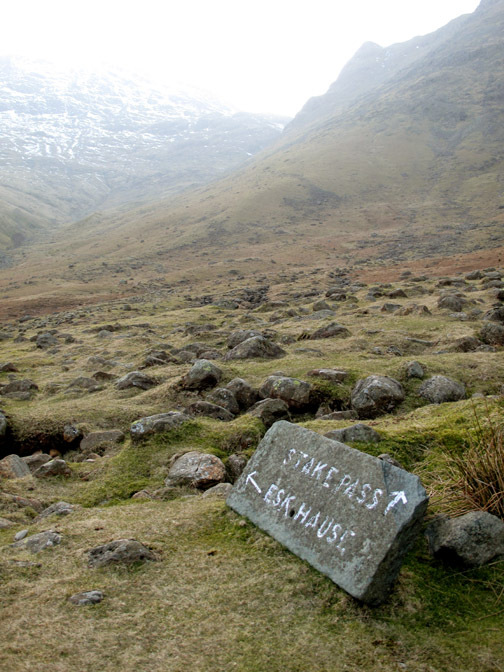 It is time to take to the grass for a direct ascent of the Black Crags end of Rossett Pike. Don't look for any great path as the route is little climbed . 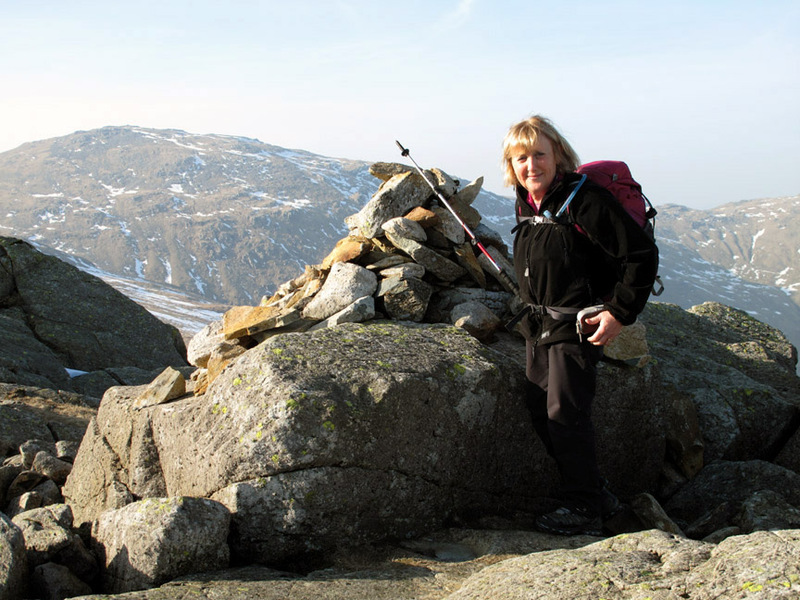 . . but there was a cairn or two occasionally. Maybe the snow patches were hiding the specific route. Climbing up, the full extent of the drumlin field at the head of Stakes Path opens out below us. 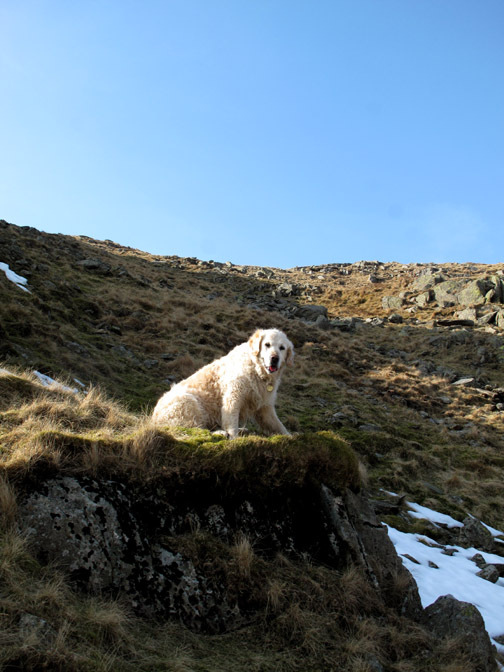 Having lost our lofty companion for a while, the climb reveals the proud summit once again. The full extent of the high ground behind the Pike is now in view. 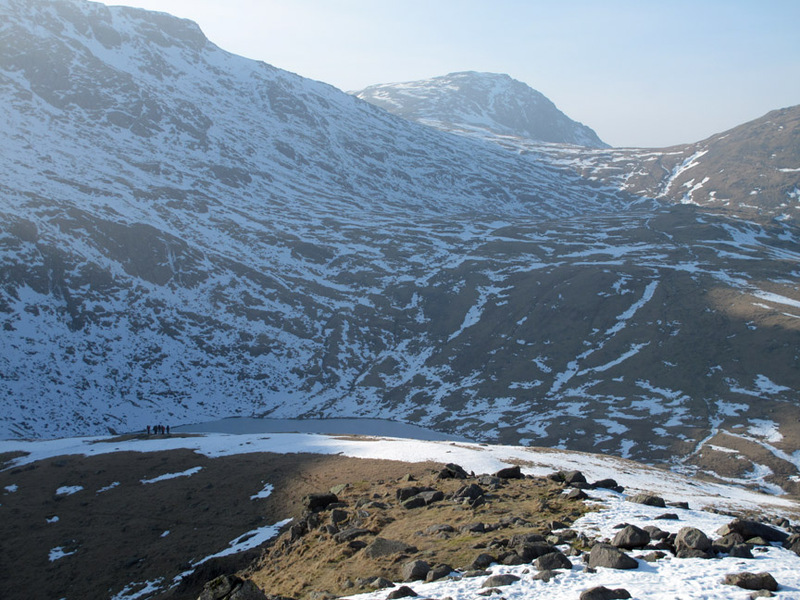 The dappled snow covers Martcrag Moor, the skyline leading across to Thunacar Knotts and High Raise. The snow was icy but soft enough to kick steps. Bethan waiting for us on the way up. Harry already there . 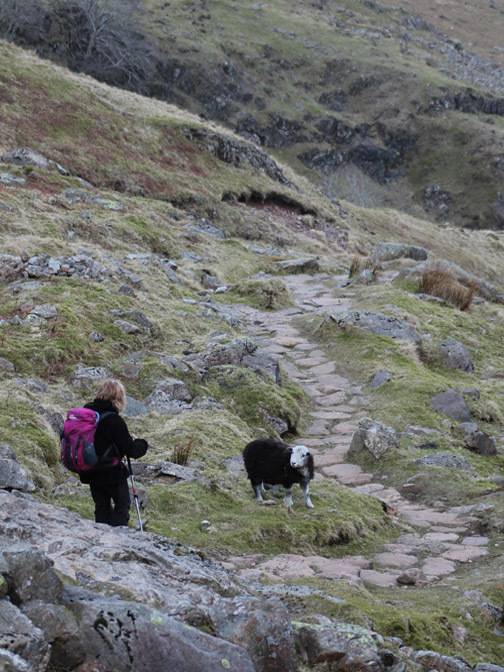 . . not far to go to complete the direct climb up through Black Crags. The book and the map show a path traversing around the front and missing out the summit, but we didn't spot it. Maybe it was lost in a snow patch ? Had we taken it then we would have missed this minor, yet still impressive top. 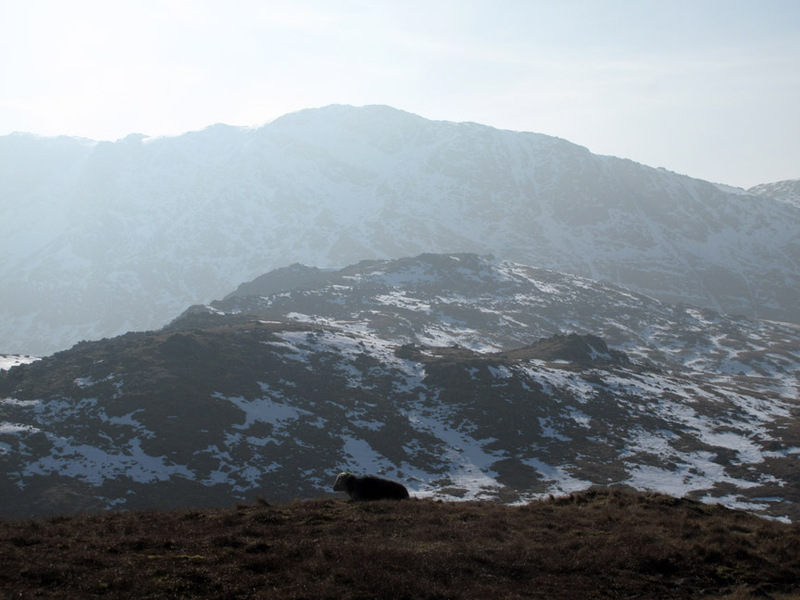 We're looking across here to Little Gill Head and Rossett Pike summit, with the mass of Bowfell behind. Let's not forget the local resident today, her temporary rest disturbed by our arrival . . . sorry about that. Living on the edge . . . but the background is a bit hazy . . . let's try again . . .
That's better . 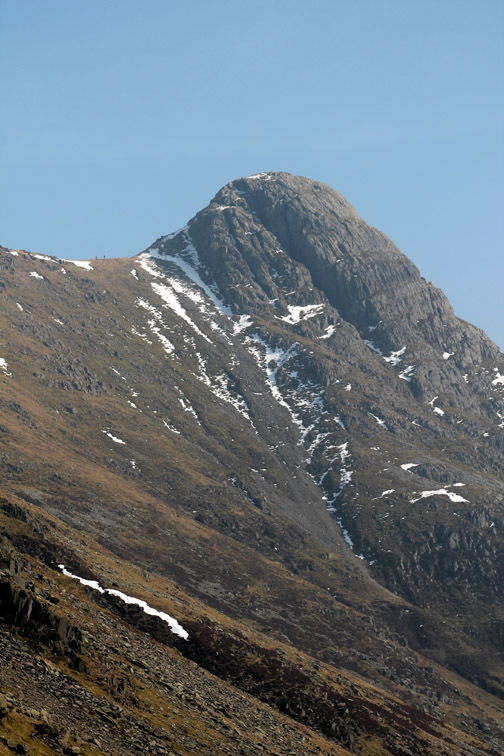 . . capture the photo of Pike O'Stickle yourself . 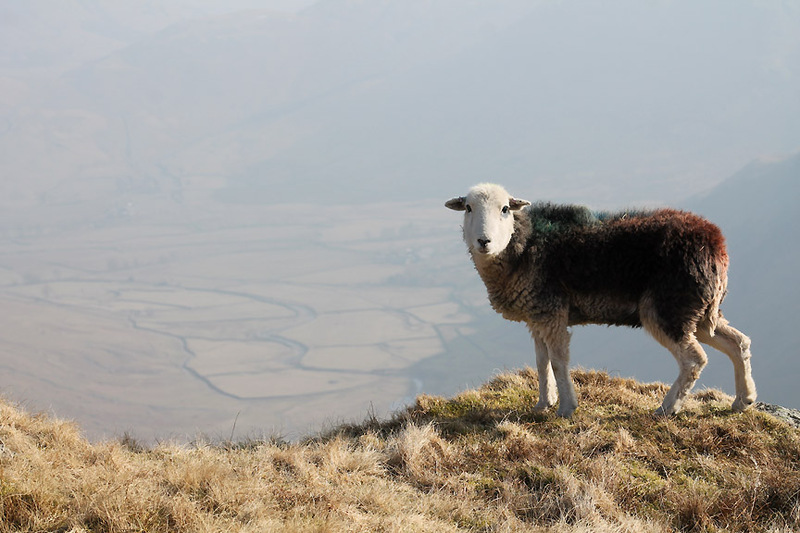 . . make sure the sheep is looking at you . . .
. . . hold your cursor over the photo to click the shutter and download the photo ! Never mind . . . have a look around at the view instead. 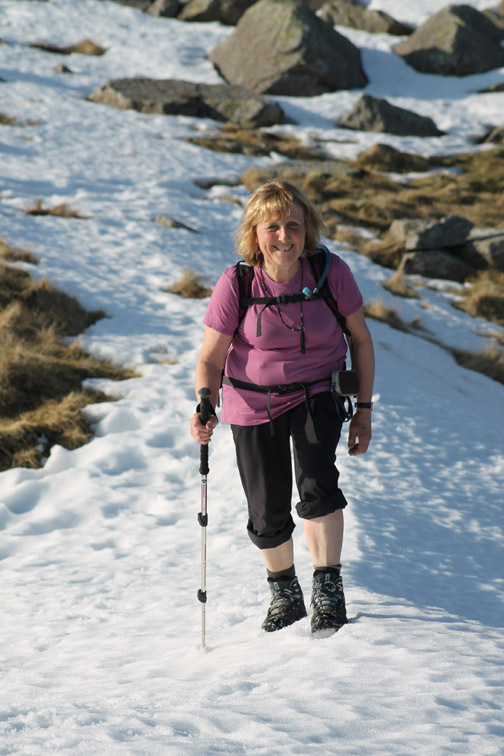 Ann making her way across the ridge of Rossett Pike. 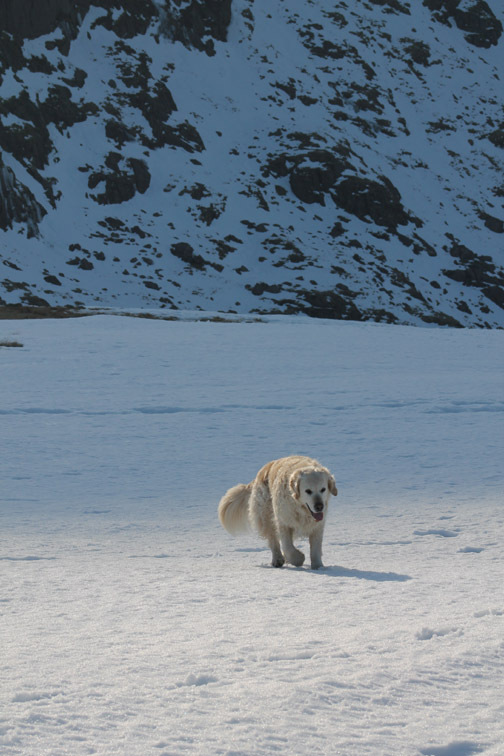 Plenty of snow still about but it was possible to avoid if you preferred. 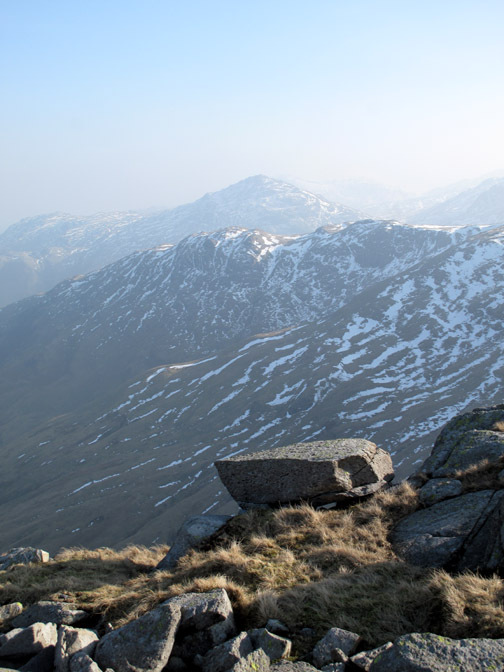 The view to the right of Glaramara from the start of the final short climb to Rossett Pike summit. Gentle slopes meant we didn't need any spikes. Ann enjoying the snow . 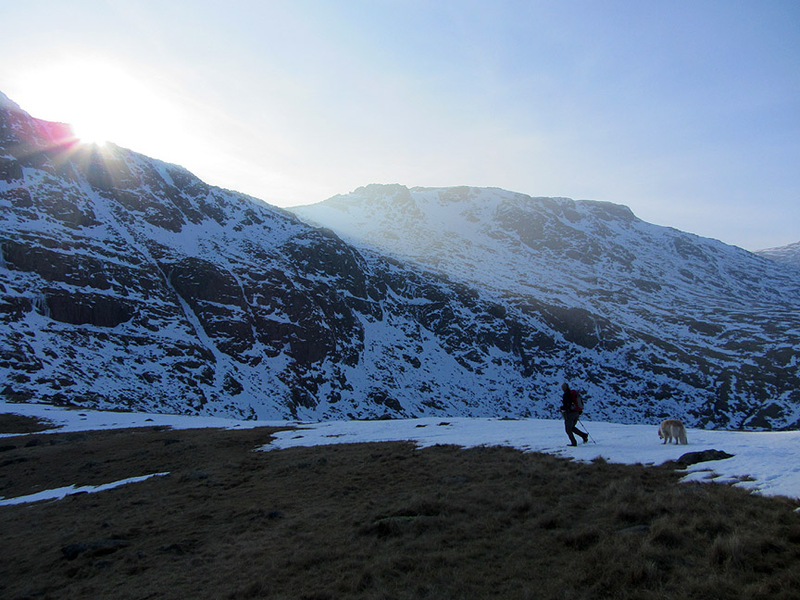 . . against a backdrop of Great End and Esk Hause. 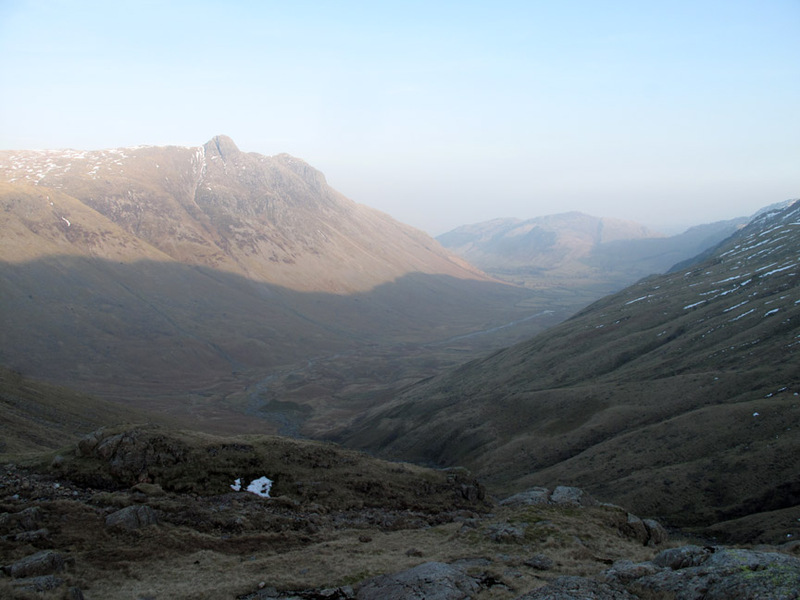 The rise of Tongue Head splits the Allancrags Gill and the Angletarn Gill at the head of Langstrath. Picking our way up through the rocks. 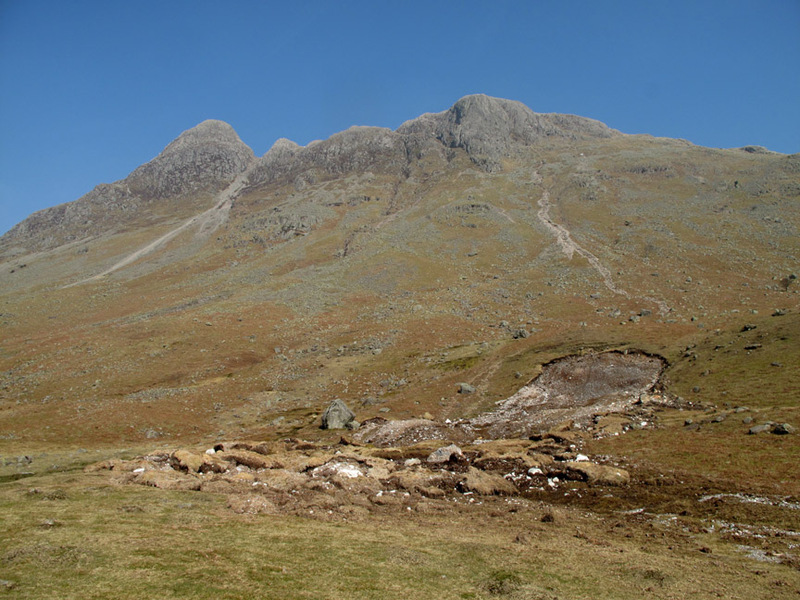 A large boulder overlooking Mickleden. 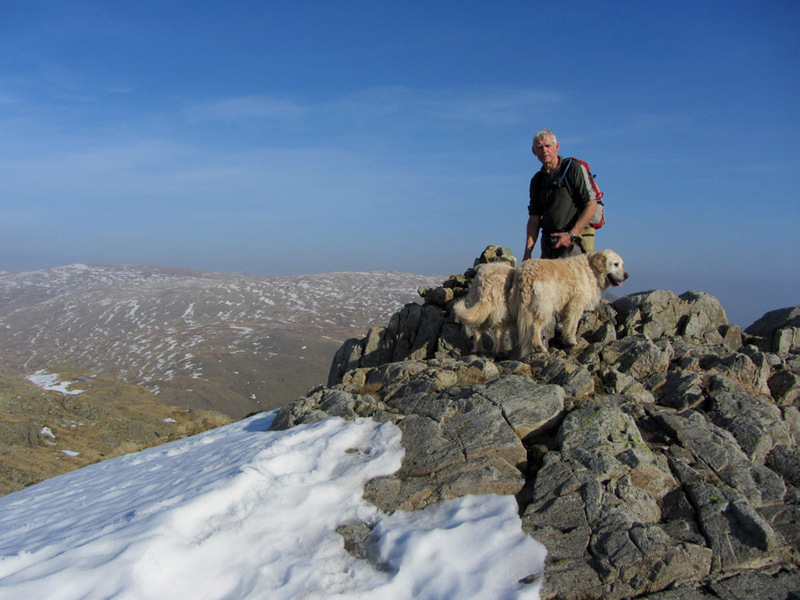 The final snow ridge to the eastern summit of Rossett Crags . 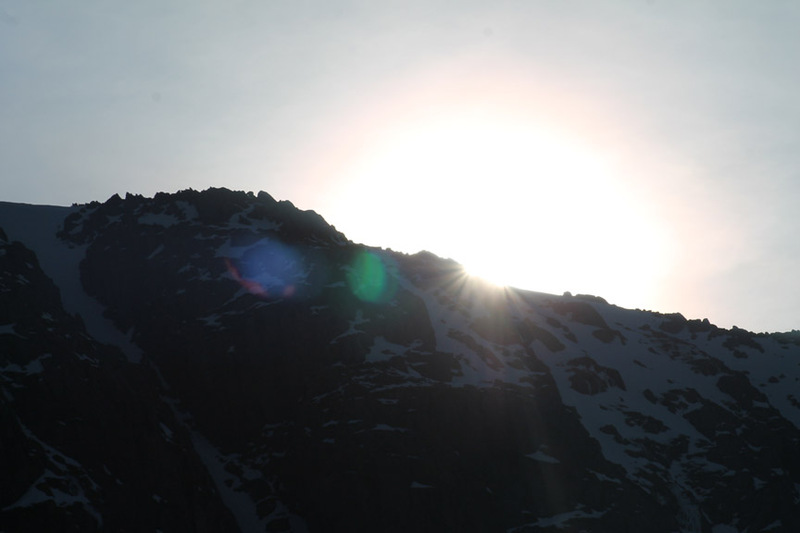 . . the apparent summit from below. 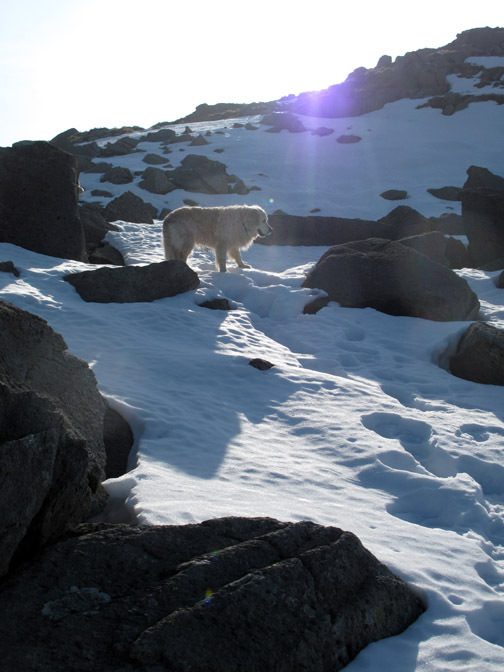 Ann caught a photo of me on the summit. 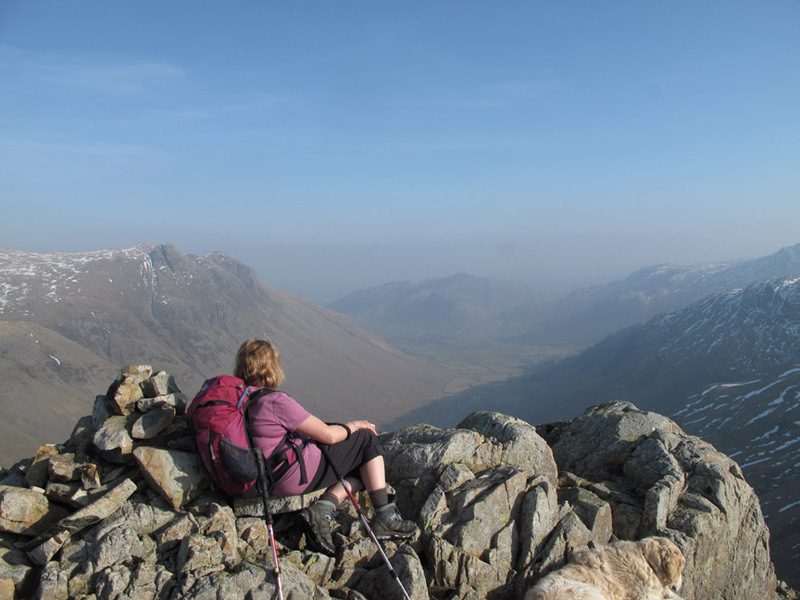 on her final summit bid ! were cast aside in favour of . . . .
. . . a nice place to sit for lunch ! Time passes . . . delightfully . 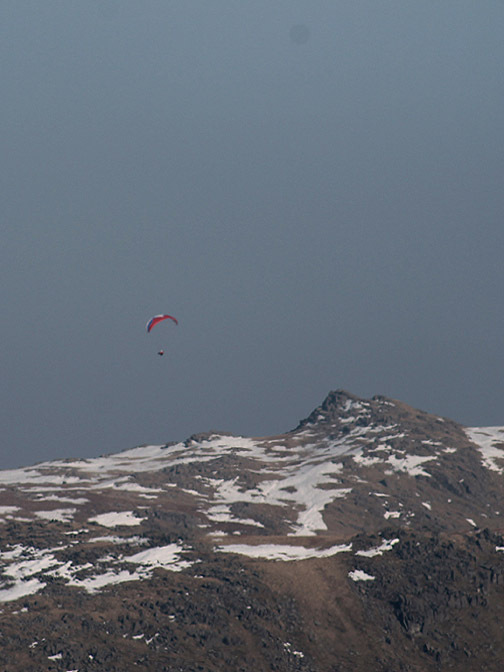 . .
We watch a paraglider high over Harrison Stickle . .
. . . as he manouvered back and forth in the gentle breeze. 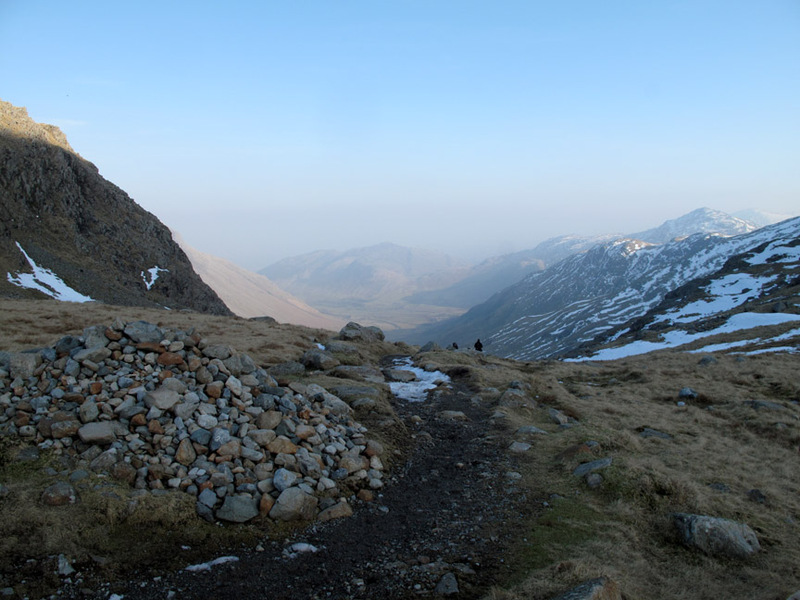 and afterwards climbed the last few yards to the true summit of Rossett Pike. The views were hazy but otherwise excellent. 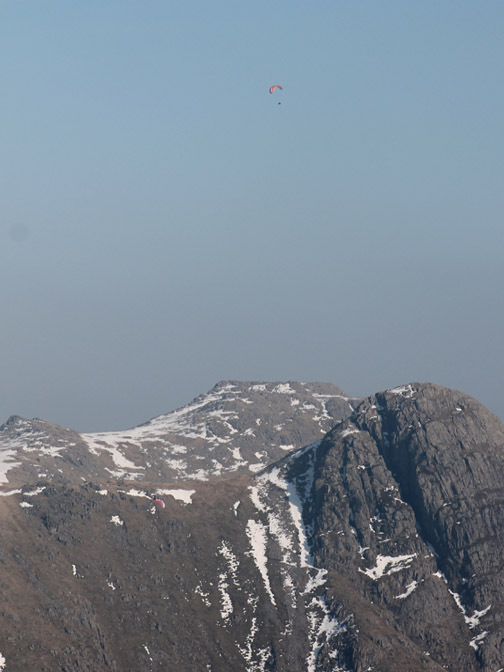 Zooming in on Pike O'Blisco with the Band in front and the Coniston Fells behind. 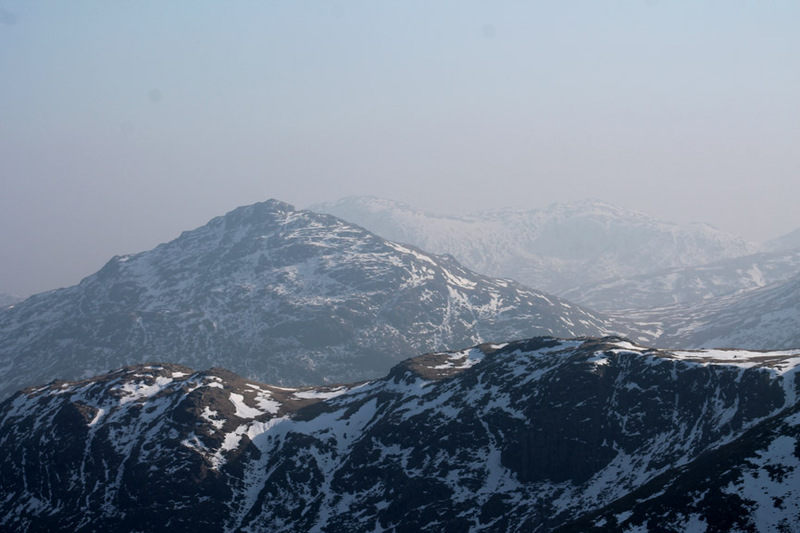 from the summit of Rossett Pike. 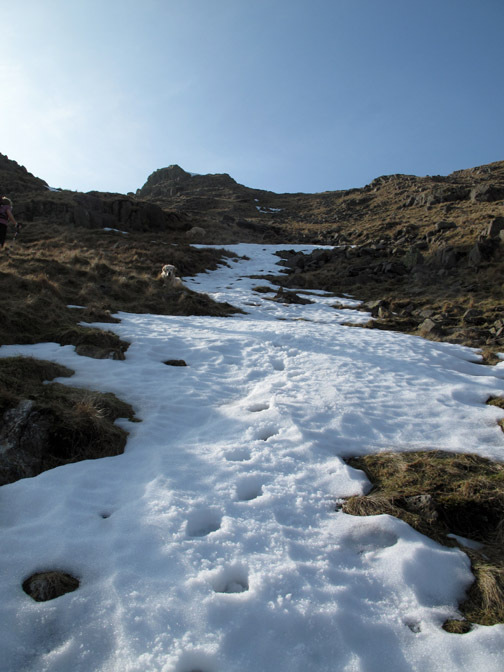 There was sufficient slope and sufficient snow to put on our micro-spikes for the descent towards Angle Tarn. 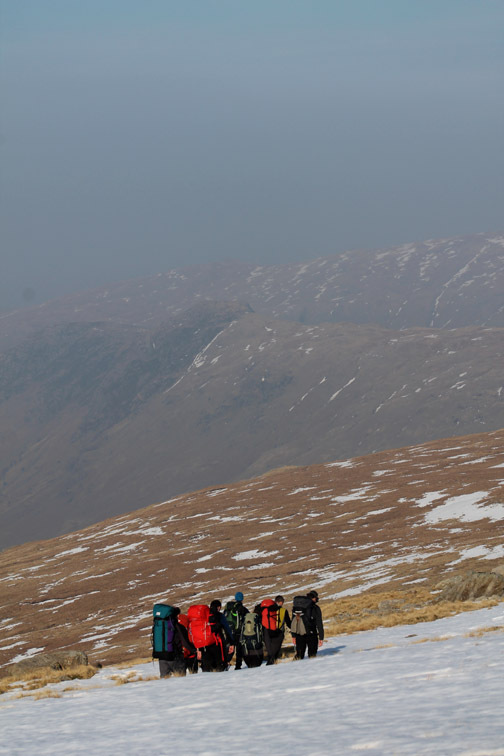 their guide pointing out the why's, wherefore's and what if's as they progressed slowly across the snow covered fellside. 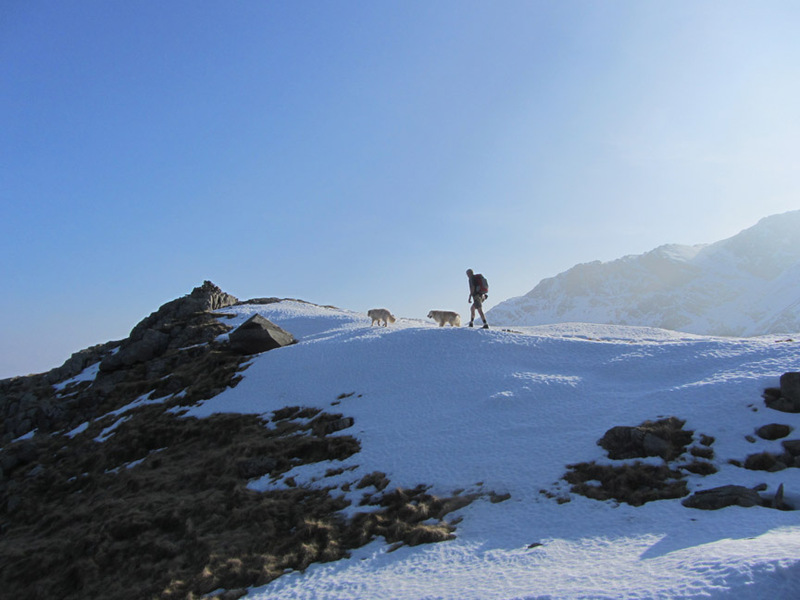 Off they went, towards Stake Pass . 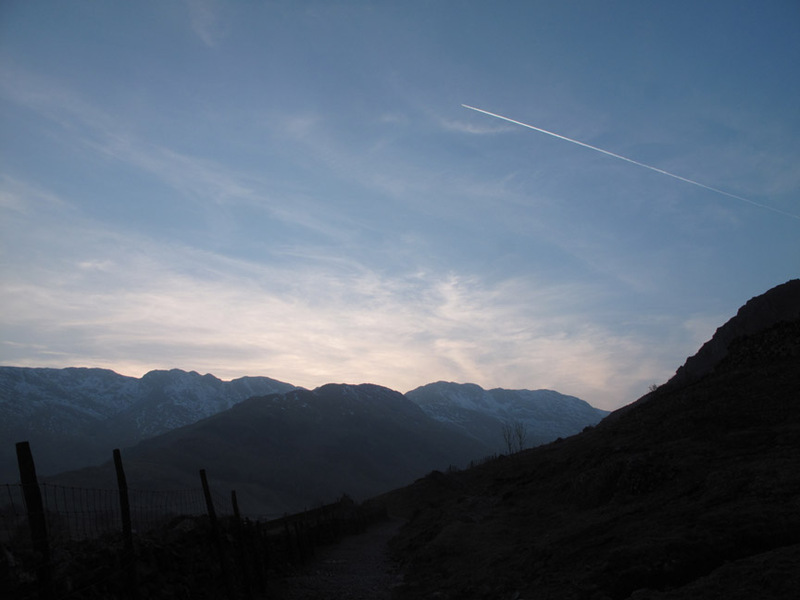 . .
and the lengthening shadows climb up the fell to meet us. 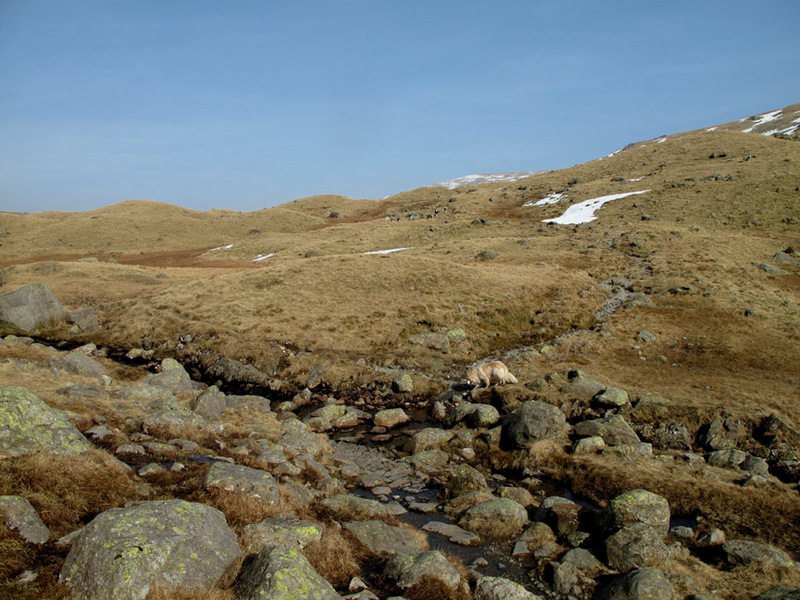 for it will have left the Mickleden Valley before we had chance to get there. 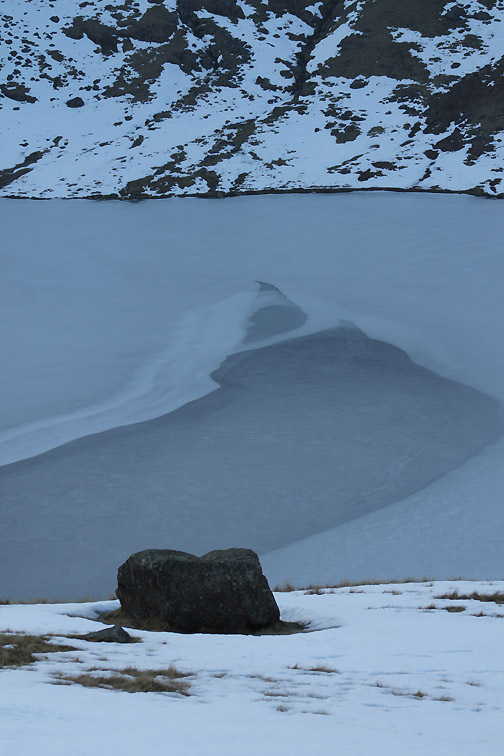 Iced over Angle Tarn . . .
. . . and the fell was also still in wintery mode. 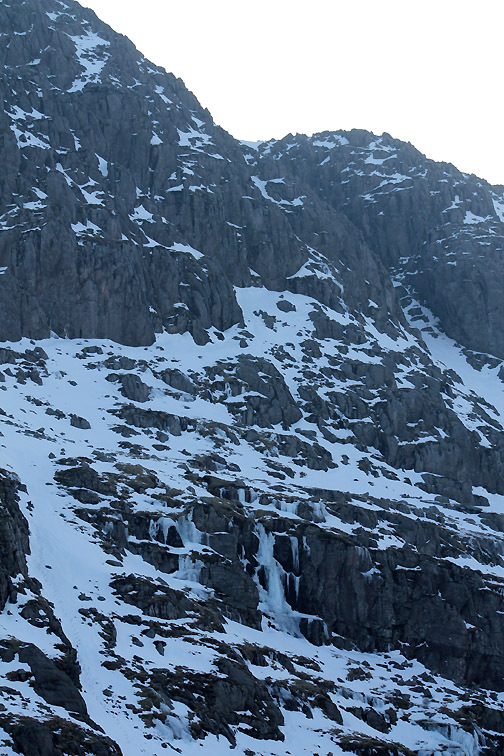 The climber's traverse and the climb up the Slab look totally iced out from here . 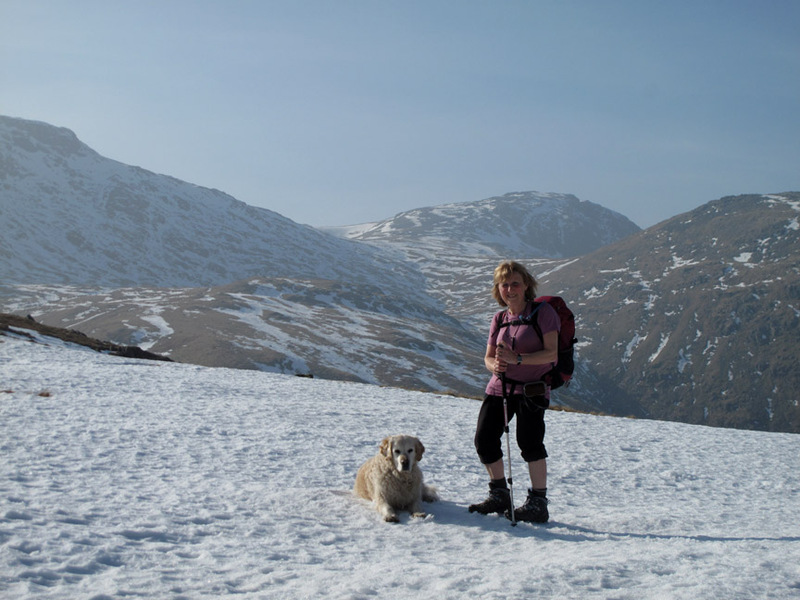 . . technical winter walking should you wish to try. 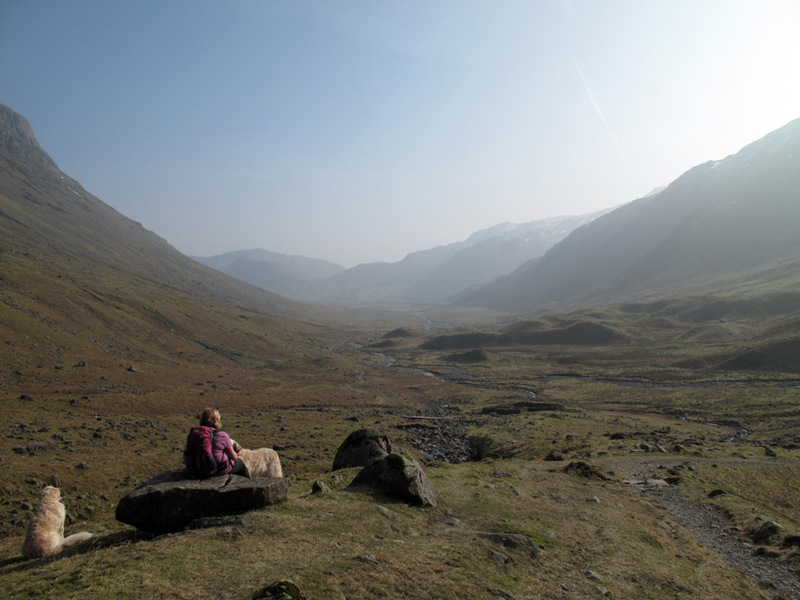 A last look back at Angle Tarn and Esk Hause before we turn for the descent of Rossett Gill. Find the cairn . . . follow the path . . . It is a well trodden route and difficult to miss. Pitched on most of the steep sections . . .
. . . lower now and out of the snow. Out of interest we had removed the microspikes soon after leaving the coll as the "rock to snow" percentage had changed. 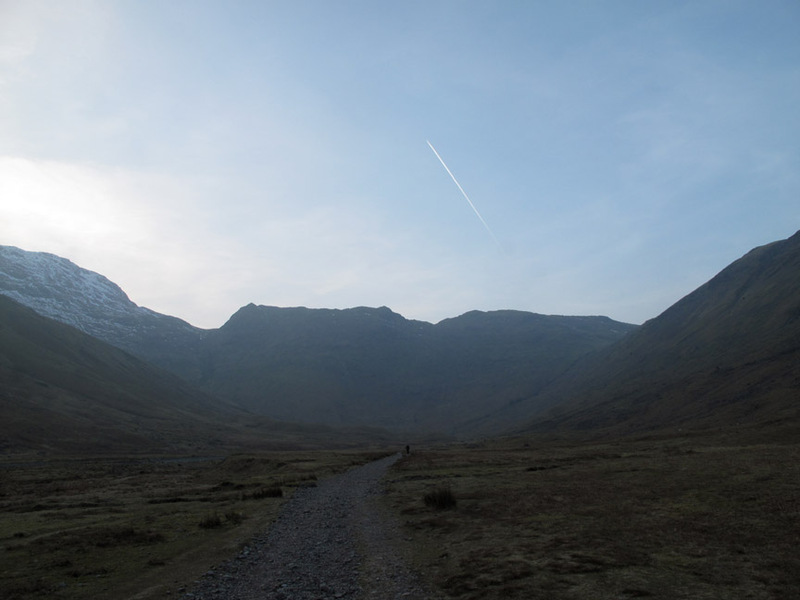 I made a slight diversion higher up to try and locate the Pack Woman's Grave but to no avail. Maybe I had misjudged its location or maybe it was hidden under the snow ? 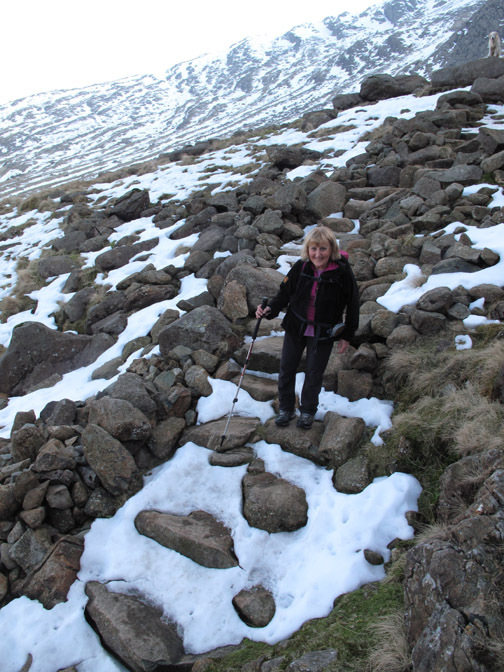 having completed a round walk of Rossett Pike.
" Up and Back "
Once more over the bridge . 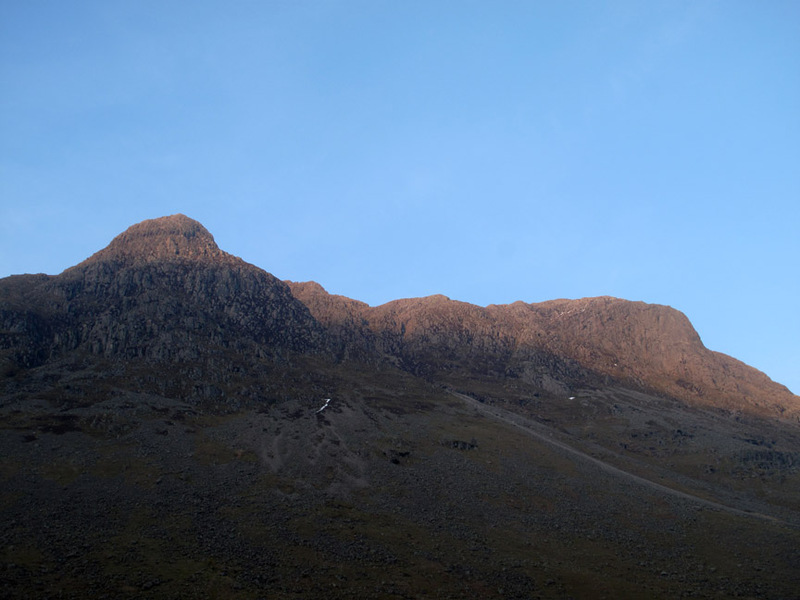 . .
was accompanied by the changing colours on Pike O'Stickle and Loft Crag. Twilight won't be far away. That's another walker following us down before the day ends. 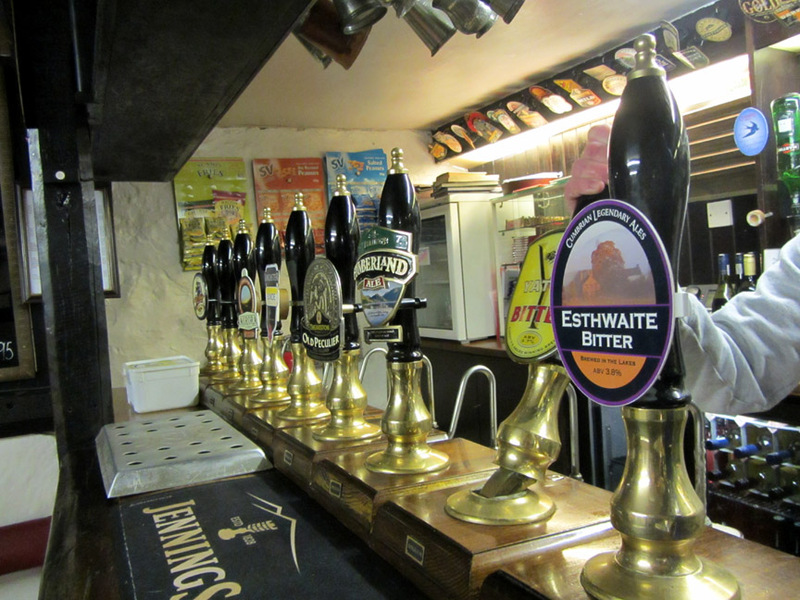 Over the slight rise and it is downhill all the way to . . .
. . . a re-hydration stop at the ODG . . . take your pick ! 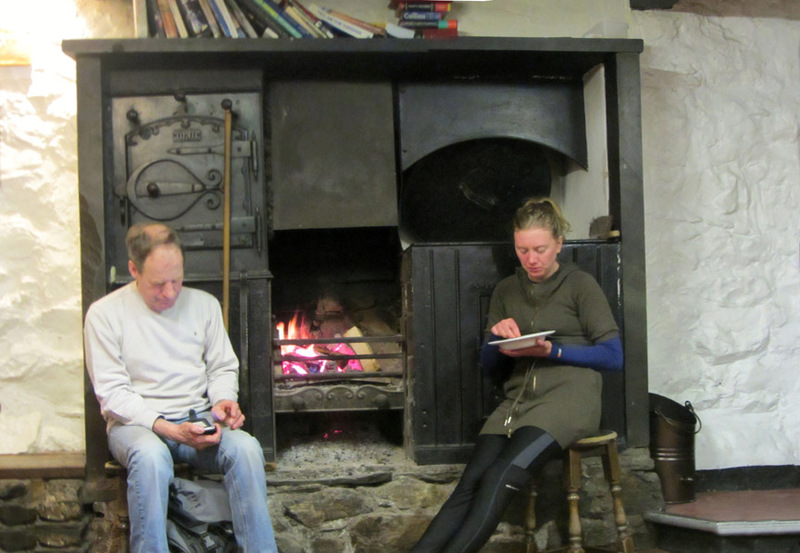 The warm seats by the fire were taken. "He" had his smart phone . . . she had a very technical i-Bowl . . . it was full of micro-chips !! 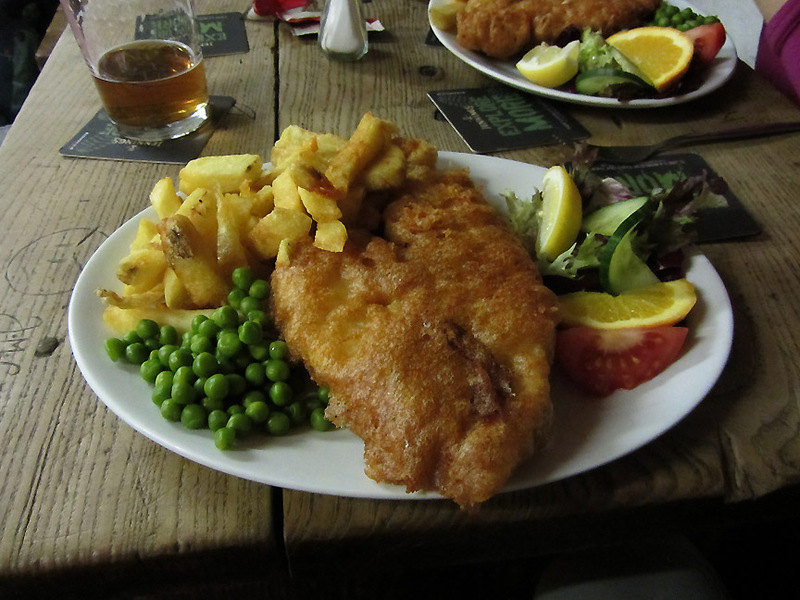 Our table was full of rather nice fish and chips to finish the day. 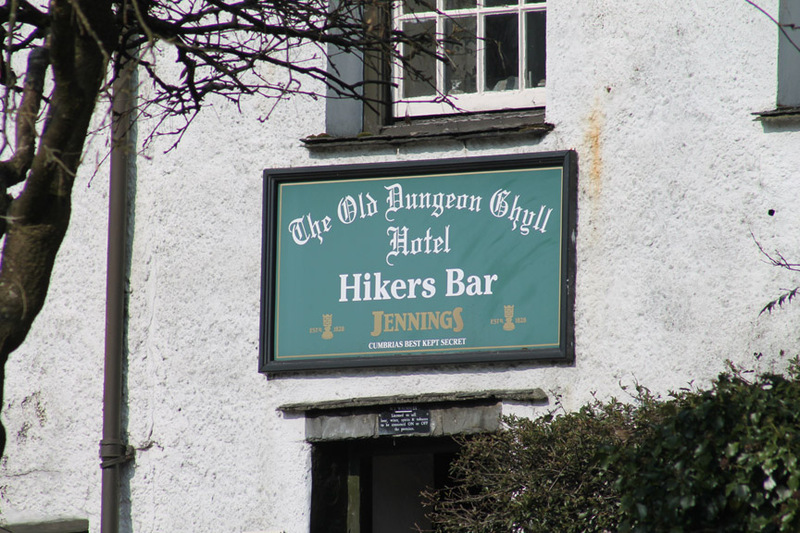 Full marks to The Old Dungeon Gill Hotel and particularly the Hiker's Bar and its staff. This site best viewed with . . .a knife and fork at the end of the day.